Playing in warm water makes a huge difference! Not only do you enjoy a warmer swimming pool all summer long, but you can also begin using your pool more in the spring and longer in the fall. Whether you’re an early morning swimmer or have family members that like to play in the pool for hours, solar pool heating is the solution! And Solaron of Granite Bay sells it! Solar pool heating runs very simply, with no flames and electricity is only required to run the swimming pool pump and any automated controllers. So running the system is considerably economical. According to the Department of Energy, installation costs about the same as investing in other types of pool heaters. Afterwards, solar pool heaters tend to endure longer than electricity or natural gas heater systems. Therefore in the end, solar pool heating makes the best money sense. When spring comes, suddenly it is 80 degrees out. But the nights are still cold and the pool is just a little too chilly. At this point, you find yourself wishing you had solar heating! That’s why it is time to begin thinking about heating your pool! Solar not only keeps your pool warmer during the summer, but it also lengthens your swim season from at least April to October. Olympic rules state that a competition pool has to be kept at 79 degrees Fahrenheit, with no more variation permitted than one degree up or down. Heliocol is used at Olympic venues to maintain such an exact temperature with systems that turns the pool pump on and off automatically. If more temperature is required, the pump runs during the day. If cooling is required, the pump runs at night. 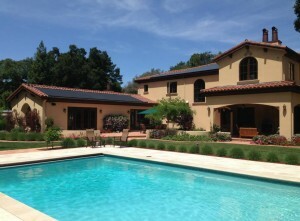 You too can benefit from exact temperature control by investing in a fully automated Heliocol solar pool heating system. Solaron is the #1 Heliocol installer in California, and we all recognize that California and the Granite Bay area have a lot of swimming pools! Every solar pool heater system reduces our collective use of electricity or natural gas, providing useful convenience with the minimum environmental cost. For more information about Heliocol pool heating for commercial or residential use, contact Solaron at 916-631-9293.